I love my altar. I love my space, as my study is my safe haven. It’s where I can come and just be me. It’s where I study my path, it’s where I study uni, it’s where I crack out the assignments and get the Awen flowing! 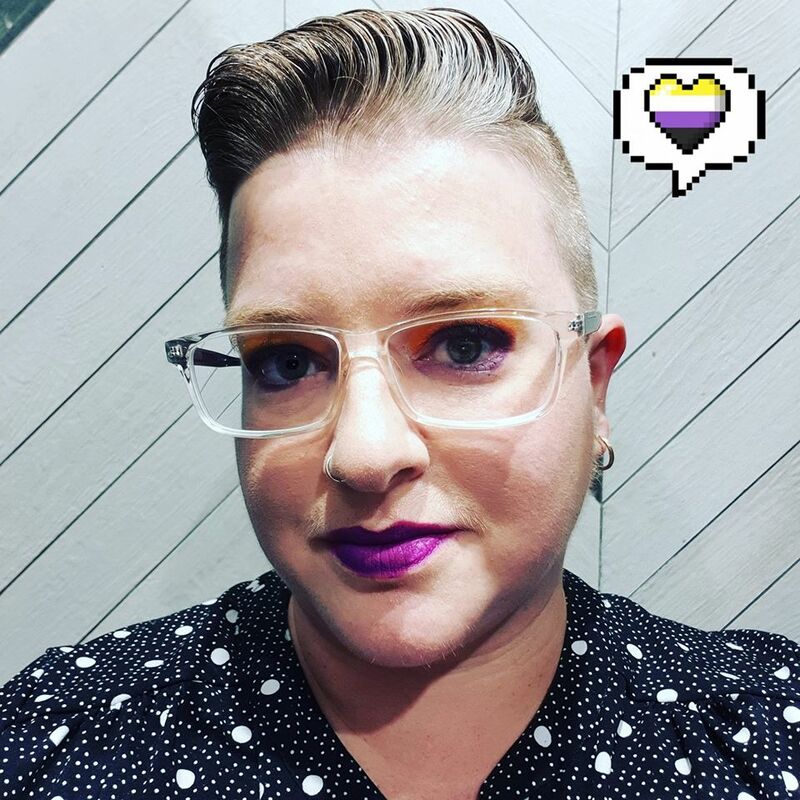 Australis Incognita has written a beautiful piece on this week’s topic. It’s so beautiful and enchanting I’m struggling to find words to explain what it’s about because I don’t want to do it an injustice, so you’ll just have to go have a look for yourself. In all I have three altars in this room alone. 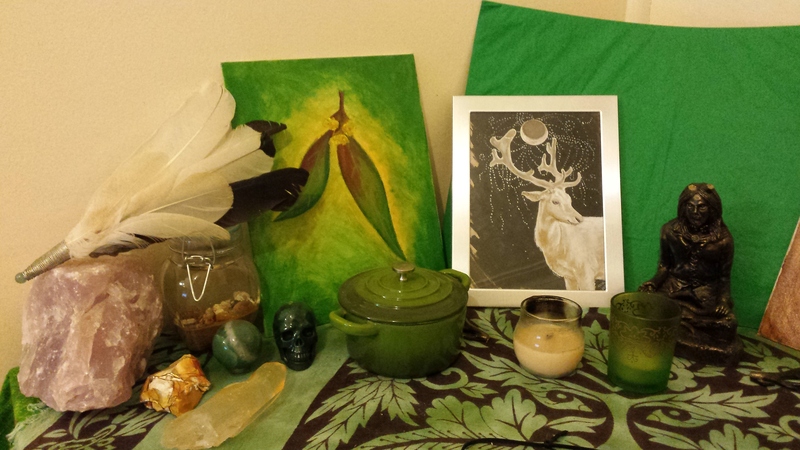 I have my main working altar, which is also focused on Herne the Hunter. I have one that has a Druid/Avalonian/Albion focus; and one to honour the Ocean and my past. Once I was someone who wouldn’t show what their current altar looks like, and it has changed since these photos are a few months old, but I thought this post would be a fantastic opportunity to give shout-outs to some amazing artists out there with some brilliant skills! I have a giant chunk of lavender quartz. The jar is a small collection of ocean water from Victoria along with shells collected on the Bellarine Peninsula. Crystals, Lumerian Seed wand and Bruce my Skull (by Raina del Magick). I made my fan a few years ago with feathers I collected on walks to and from work. The eucalyptus painting is one of my own, and the Stag is my favourite original water colour by Helen Wells. My statue of Herne had his antlers break off on the mail journey, and he hasn’t allowed me to glue them back on. My little pot is where I burn my charcoal, and it’s just something I picked up from a local discount store. Also a shout-out to Willows Crafts for the pure soy candle (a gift from my mother). The Oak leaf painting is one of mine. The print of Herne the Hunter is by the amazing Marc Potts. I’ve had this print for 11 years, and it’s still one of my absolute favourites. My athame (I call it my ‘hunting knife’ in honour of Herne’s skills) was made by Mother Mountain Forge, and my wand by Gentle Eagle Creations. My little plate is an Aboriginal design bought from a store in Victoria years ago, and holds a collection of crystals and personal items. I don’t use this as an athame in the traditionalsense as I don’t cast circles. When I saw this at Mother Mountain Forge’s stall at the Australian Wiccan Conference (AWC) in 2012, my hands vibrated and pulsated when I picked it up, so I knew it was to come home with me. All of the shells featured here were collected along the Bellarine Peninsula in Victoria. There’s a fantastic “local secret” beach (which I probably couldn’t remember how to access now) that has a fantastic shelly beach. I collected these before our handfasting and our move back up to Sydney. The beautiful print is by the amazingly talented Ravynne Phelan. I’ve several of her prints around the room at the moment. And I probably don’t light the himilayan rock crystal lamp as often as I should. I like to think that this altar helps bring balance to the rather earth-dominated room. First of all – yes. That is a Barbie. That is the Dolls of the World: Ireland Barbie that I use to represent a Welsh Goddess. I don’t believe Cerridwen seems to mind, as she’s never had an issue with it in the years that I’ve had her. You can’t tell from this angle but the oil burner looks like a cauldron. As I’ve been asked before, The Dark Goddess statue is by The Leonardo Collection. I’ve had her for over a decade and the store she came from closed down a long time ago. I don’t remember what stone my dragon is holding. I remember buying it because I picked it up and saw a dragon flying in it, so she’s been looking after it ever since. The big tumble at the front is my favourite piece of fluorite. My altars are far from elaborate, and have changed so many times over the years. These are all bits and pieces I’ve collected over 15 years, or things that I’ve made – but the each have meaning and represent far more than I can explain on here. As much as I wish I could go out into the bush each weekend, I can’t. Because of work commitments, uni, family etc. and the fact that there’s no where you can go in Sydney where you can be alone with your thoughts and not hear other people. My urban altars are spaces on top of drawers, shelves, or a specially set-aside small computer desk. I have utilised the space at my disposal, and it works for me. My main altar is both a focal point of my practice, and can be utilised for personal readings and spellcraft. Exactly what I need it to be! You altars are lovely. I especially like your main altar and that Dark Goddess statue is divine!